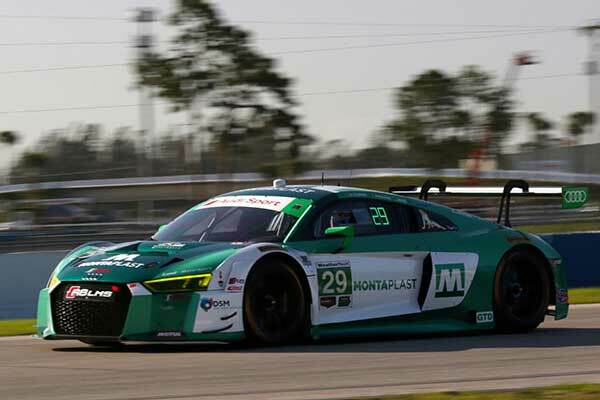 The 2018 sportscar racing season is heating up again after the big endurance races which populate January and early February. This weekend sees the 66th running of the world-famous 12 Hours of Sebring, and it’s set to be a corker, with a big entry and quality oozing from each class. It has not got the sheer numbers of the Rolex 24, or the same number of F1 talent in the field, but what it has got is intrigue up and down the field and one of the most iconic settings in endurance racing. 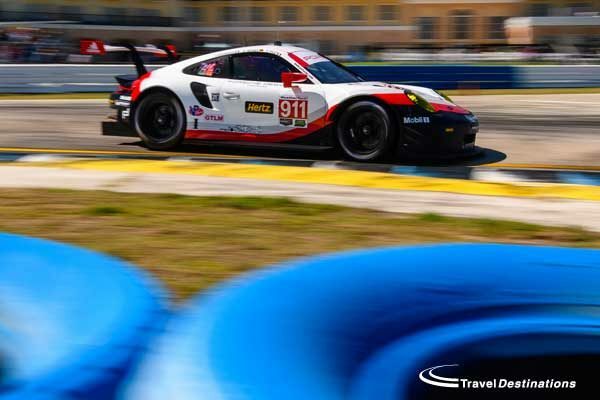 Once again Travel Destinations customers have travelled to be track-side for the 12 Hours of Sebring for what will be sure to be another action-packed race, with lots of entertainment both on and off the track. Can Action Express go two out of two? 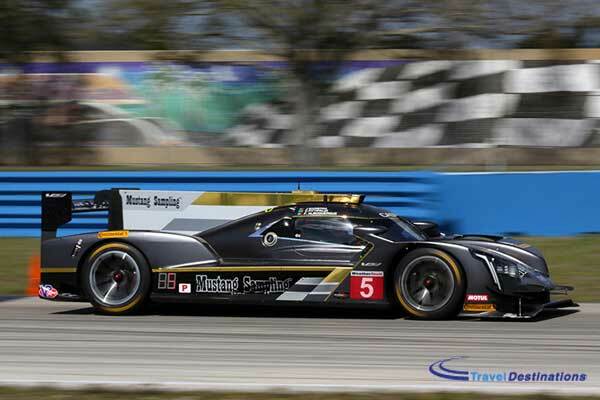 It’s almost too easy to predict another big win for the Cadillac DPi V.R this weekend. The car, even with its new engine for this season, has both the performance and reliability to topple the other major runners. With the majority of the focus on the Prototype ranks at each IMSA meeting, many will ponder the potential for another team or manufacturer to take a big win. Action Express scored a historic 1-2 at Daytona in January, and did so in distance record shattering fashion. For the 12 Hours of Sebring, there’s surely the potential for a repeat with its two Cadillac DPi V.Rs back with an almost identical set of drivers; the only change being Stuart Middleton departing the team after his (impressive) one off drive as a prize for winning the Sunoco Challenge. So who can challenge? Well, obviously Wayne Taylor Racing will be hoping to first of all get points on the board after retiring from the Rolex 24, and second, take another big 12 Hours of Sebring win. But WTR is another Cadillac team. Outside of the GM brand’s representation, you’d have to point towards Acura Team Penske and or ESM for a potential upset. Acura Team Penske impressed mightily in its return to sportscars at Daytona, its Acura ARX-07s was in the mix throughout. Only small niggles dropped them down the order towards the end of the race. They’ve got what clearly looks like a good base package as well as a high calibre selection of drivers and team personnel to do it. ESM on the other hand, had a miserable Daytona with its pair of Nissan DPis. But let’s not forget that towards the end of last season, which wasn’t that long ago in the scheme of things, the plucky American privateer outfit hit its stride and won Petit Le Mans. Don’t be surprised if the former FIA WEC outfit features on Florida’s bumpiest circuit! Is there any hope for Mazda? When discussing potential winners, it’s easy to forget the Mazda contingent in the Prototype field, and for good reason; it has been another tough start to the season for the Japanese marque. 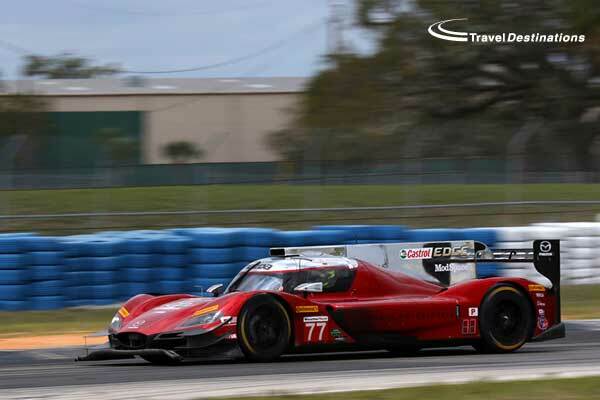 Mazda Team Joest will be highly motivated for a strong showing at the 12 Hours of Sebring, after both of its updated RT24-Ps failed to impress on pace, and retired from the Rolex 24. If anyone knows how to turn a ship around, and win big is Ralf Juttner and the Joest team, but this may be a tall order. The car, which struggles at higher-speed circuits, just hasn’t been up to the task, even after months of aero, cooling and suspension work in the teams self-imposed long off season. To make matters worse, the Joest team was forced to pack up early after a fire for its No.55 in the pre-event test. Any sort of result would be massive here, as the belief inside camp Mazda is still positive for the future. On Joest’s first run in the event since 2013, a win isn’t expected, though fans in the stands would be overjoyed if the team had a good run. Will we have to wait until Long Beach, where the track is tight and the race is short, to truly see what the updated RT24-P is made of? This time round, GTLM could very well be anyone’s game, after Ford’s dominant formation run in Daytona, the rule makers have pledged to tighten the field with the pre-Sebring Balance of Performance. This comes after BMW’s dispute with IMSA at the Rolex 24 (which went public), where its M8 GTLMs struggled on their competitive debut against the other marques on pace. 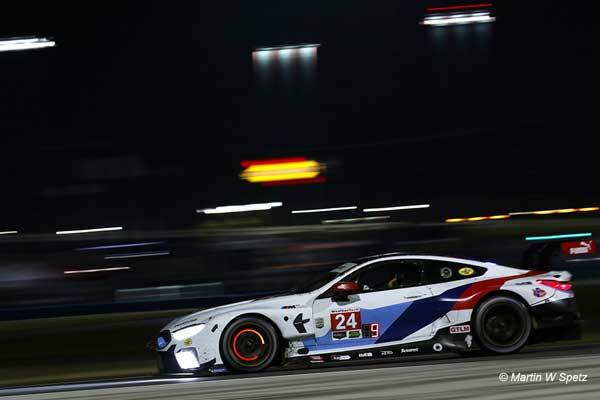 For the 12 Hours of Sebring, BMW has been given a power boost and an extra two litres of fuel, while Ford has had two taken away. Whether or not that will make this a dogfight between all five makes remains to be seen, but it should nevertheless be a step in the right direction. If BMW, and Porsche’s 911 RSRs – which also had a rough Daytona – can fight for the win, it will only add to the spectacle of this year’s once-around-the-clock classic. Lovers of loud, yellow, GT machinery will be pleased to know that on what is likely to be the final 12 Hours of Sebring for the Corvette C7.R GTE, there is a lot to play for. 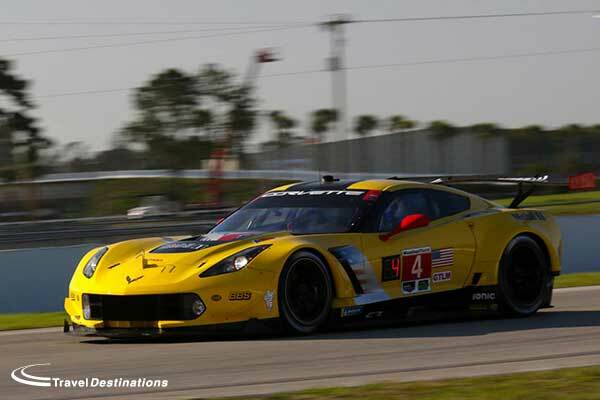 Corvette Racing, which will of course be in the mix for yet another big title, will hope to mount its challenge on Ford with another big win at Sebring. Chip Ganassi’s Ford crew may be the favourites after dominating at Daytona, but if Corvette takes the fight to the ‘Blue Oval’, and wins, it will be its fourth consecutive Sebring victory. For its drivers there’s some key milestones to keep an eye on. Corvette’s Jan Magnussen is making his 20th 12 Hours of Sebring start, (elsewhere BMW’s Bill Auberlin is making his 25th) and British ace Oliver Gavin, has the most class wins of anyone in the field, and will be gunning for his seventh victory at the historic circuit this year. Corvette Racing meanwhile has the most Sebring class wins of anyone else in the IMSA field, with 11, and will look to add to that tally here. Can Land get revenge in GTD? Those who followed GTD at Daytona will remember the controversy surrounding the Land Motorsport penalty. The German team, which was leading the GT3-based class by a healthy margin, got pinged by the organisers for fuelling quicker than the other teams. But, IMSA in this case penalised the team in error, its Audi R8 LMS GT3 and fuel rig passing tech inspections before and after the race. Land Motorsport, which won last year’s Nurburging 24, and has an ADAC GT Masters title to its name in its short time as a premier Audi customer team, will be out for revenge this weekend. Even if it does spend the same amount of time re-fuelling as everyone else this time round, they’ll have a shot at the win. The team has shaken up its driver crew for this one though, Alessio Clemente Picariello joining the team, while Kelvin van der Linde and Jeff Schmidt sit the race out. In response to the Daytona incident, it’s notable that IMSA has announced that it will be implementing minimum refuelling times from Sebring onwards to prevent a repeat of the events. For Sebring, the GTD minimum will be 40 seconds, in GT Le Mans it will be 34, and in Prototype, it’s set at 30. For those thinking ahead, the Sebring 2019 promises to be a special event. Not only will the IMSA 12 Hours of Sebring take place as usual, but the FIA WEC Super Season will also race on the same weekend. Effectively there will be two 12 hour races taking place in just 26 hours at Sebring 2019. For those wishing to be at the 2019 event, we recommend booking early. Travel Destinations has already contracted some accommodation for Sebring 2019 and provisional bookings are already being made. Call the Travel Destinations team on 0844 873 0203 to find out more and reserve your place at Sebring 2019.